It was a baby’s toy, of all things, that sparked a new spacecraft design concept to explore the murky surface of Saturn's largest moon. Adrian Agogino and Vytas Sunspiral, who both work in the Intelligent Systems Division at NASA Ames Research Center, were batting around a "tensegrity" in the office a few years ago. Similar to a bicycle wheel, but with more corners to it, a tensegrity shape has a system of wires and cables that deform when you press on it, then spring back when the pressure is released. This makes it perfect for small children to bash the toys against their head, other people or the floor without causing damage. Rovers like the ones we’ve sent to Mars would not fare well in the marshy environment on that moon, and a rover geared for Titan would be a design challenge because the moon’s shorelines are poorly understood. Image of the SuperBall landing. "Titan is a very interesting destination, and a very difficult destination, for the same reason," said Agogino. "It has lakeshores, mud, rain, and terrain that is uneven, and we don't know much about it. That makes it very dangerous for conventional rovers. A rover can get stuck, or can fall over a hill. We don't have good knowledge of the terrain from space." The team's "Super Ball Bot" tensegrity shape recently received Phase 2 funding from the NASA Innovative Advanced Concepts program. 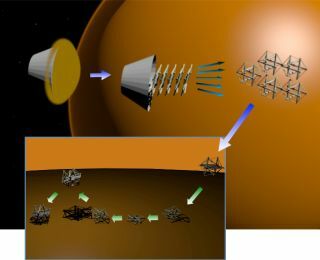 With $500,000 in funds to use in the next two years, the researchers hope to nail down the right size and shape for their spacecraft to explore Titan and seek possible signs of habitability on its surface. A basic diagram of the SuperBall structure. Further investigation showed that Titan's atmosphere has organic aerosols, called tholins, that likely formed from molecules such as methane and nitrogen. When the Cassini spacecraft arrived at Saturn's system in 2004, it carried a lander – Huygens – that successfully reached Titan's surface on January 14, 2005. Later measurements showed that Huygens likely broke through a hard crust and sank into softer material below.That would not be a friendly environment for a rover; the Spirit rover on Mars, for example, became permanently stuck in place after breaking through a hard dirt crust in 2009. A tensegrity shape, however, would be perfect under those conditions. The cables and rods within the structure can flex and move according to the ground beneath. It can mash itself into a small area, like between rocks, and then get itself unstuck again. Moreover, in the soupy area beside a lakeshore, the Super Ball Bot could roll itself right up to the liquid without the fear of sinking into the ground. "It operates the same way that animals do," Agogino said. "Muscles expand and contract. So in some senses it is the same principle, but more elegant." Landing would be a cinch with a tensegrity; rather than worrying about parachutes and landing gear, the robot could be tossed out from a spacecraft several miles up and make it to the surface safely. The next aim is to ensure the instruments on board could also survive the shock. The first phase of the NIAC study looked at what instruments would be best suited for explorations on Titan. Several instrument packages were selected, and the researchers are now examining emerging scientific literature that show more lightweight versions of these instruments. A first prototype, called ReCTeR, built by Ken Caluwaerts from Ghent University, Belgium. Also shown is the first rod of a new, larger, prototype able to roll robustly. So far, scientists identified three sets of instruments to carry: a chemistry package that would include gas chronographs and mass spectrometers to sample lakeshore environments; an atmospheric package to gather meteorological data such as temperature, wind speed and methane content; and navigation cameras and microscopes. These instruments would "live" in the center of the Super Ball Bot, allowing it to roll around on the surface without destroying the precious payloads it carries. Should one of the instruments need to take a sample, the bot's structure allows it to collapse on the spot — into a triangle shape — and press the sensor on the ground. The bot doesn't have a flight to Titan booked yet. NASA has no firm plans to send anything to Saturn's vicinity after its participation in the Cassini mission ceases in 2017. NIAC, however, is where interesting mission concepts get a chance to shine. The Super Ball Bot's success in NIAC, therefore, could spark an interest to head to Titan, the bot's backers said. "This is the type of program that is able to support exploration that is high risk but has potentially revolutionary return," said Sunspiral. "The goal over the next two years is to continue to explore the technology and do the prototypes and the demonstrations to find out where the benefits and the challenges are." Follow us @Spacedotcom, Facebook or Google+. Published on SPACE.com.